Arthur Hacker RA (1858-1919). Hacker was an English classicist painter. He was the son of Edward Hacker (1813–1905), a line engraver specialising in animal and sporting prints (who was also for many years the official Registrar of Births, Marriages and Deaths for Kentish Town in the St Pancras registration district, north London). In his art he was most known for painting religious scenes and portraits, and his art was also influenced by his extensive travels in Spain and North Africa. He studied at the Royal Academy between 1867 and 1880, and at the Atelier Bonnat in Paris. 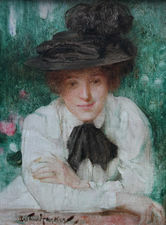 He was twice exhibited at the Royal Academy, in 1878 and 1910, and was elected an Academician in 1910. In 1894 he was the subject of a bust by Edward Onslow Ford. An original portrait by Hacker of Sir Alfred Keogh hangs in the RAMC HQ Mess at Millbank, London. In 1902, Hacker built a new house at Heath End, Checkendon, Oxfordshire, called Hall Ingle, commissioning the young architect Maxwell Ayrton and carrying out the decorations himself. Paintings on public display include Pelagia and Philammon in Liverpool's Walker Art Gallery, and The Temptation of Sir Percival in Leeds City Art Gallery.